It’s time to get introduced to the Magento Dashboard. In this Magento Admin guide, we’ll discuss the options of Magento Dashboard. Also, we learn about the operations and many more from the dashboard. If you’re a complete beginner and have no idea about, How to start off your first Magento store? In such cases, we at Aspiration Hosting are keen to help you to open a successful online store. Because our hosting packages include premium services in web development. Also includes 24×7 online technical support for our honorable clients over chatting. Hence clients can also open support ticket who are very shortly handled by our experts. However, we provide premium services such Cloud SSD storage, Aspiration CDN, cPanel, SSL, domain,1clickMageinstaller, and LiteMageCache etc. So, feel free to join us for fastest loading, support and UI experience. Moreover, our Mage hosting plans begin from Usd 9.99 per month. Also, enjoy a startup discount up to 30% on your first-month invoice. According to our screenshot, we’re using XAMPP as our localhost. And here inside the “htdocs” folder, we have created a folder “magento”. So, here the “magento” is our “folder_name”. Also, remember we already copied our whole Magento files and folders inside and run the installation. To learn more about the Mage installation please learn this article. In such case, use your real domain name for example insteadhttps://aspirationhosting.com/magento/admin “mydomain.com”. Now hitting enter will open a login screen. Later all we need to put on the correct credentials we’ve had already received from our hosting provider to enter our Dashboard. Finally, we’re inside of our Dashboard. Storeview: In the top of our Dashboard, we can see the option store view. From the drop-down list, we can manage our multiple stores. Left-side bar: On the left sidebar, we can different tabs. However, each of them relates different functionalities of our store. On Magento 2x we have options such as Dashboard,Sales,Catalog,Customers,Marketing,Content,Reports,Stores,System,and Find Partners & Extensions etc. Here we’d like to discuss the each and every menu tab and submenus under each tab. Basically, this is the default section of Magento Admin Panel. 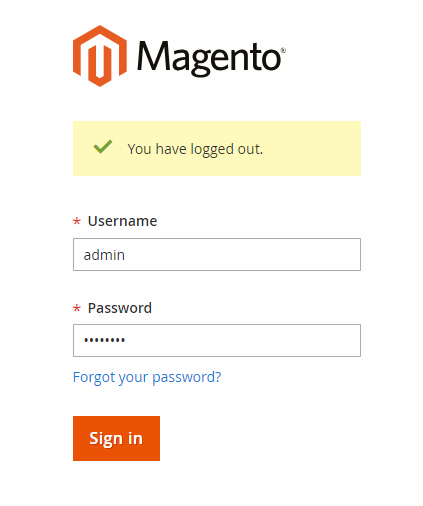 By login into Magento Admin, we can see the Dashboard. So this page is a summary or report of your sales. Here we can see important information such as Bestselling, Most viewed and customer information etc. Also, we can a summary of last orders, lifetime sales and Average order. Also, it helps us to know about the last search items and top search items. Finally, we can also hit the blue button on the top to learn more about advanced and customized reports. Second on the list is the Sales tab. From the definition it’s basically is our order management system. Inside the tab, we can see options such as Orders, Invoices, and Shipments etc. As simple as that we’ll take orders, make invoices and arrange the shipment from these sections. Further, we’ll use options like Dispatches, Credit Memos, Billing Agreements and Transactions too to manage our Sales. Third, from here, we’ll create our Products and Categories them to present them visually on the storefront. For the same reason, it’s one of the most important options among all. Simply using the Products option we can create a new product or edit an existing one. Further including more details such as images, descriptions, and options such as size, color, and price etc. Similarly using Categories we can simply categories them into sections. So, a customer can find the specific product from its category. Either it is more about a needle in a haystack. In total, we’ve 3 options here. One all customers, second Now Online & final the Customer Groups. As we can see the handling customers are more convenient in this way. As we don’t need to use any list building extensions which are most insecure. Even now we can sort our customers in their field of interest. It’s a huge section to talk about. As of now today there are thousands even millions of merchants who are struggling to sell their product on the internet. So, it becomes necessary to present each product efficiently to win sales on regular basis. In one sentence, Sales means to show right kind of product in front of the right person. Moreover, the competition is damn high. So, we can say these are following options who make Magento a compact Merchant solution. 1. Promotions: Here we can set Price rules for both Catalog and Cart. 2. Communications: Till now, email marketing is one of the proved policy to achieve great sales in the world of online stores. Simply update and inform your customers about the latest collection with exciting newsletters. And this section is all about, Email templates, Newsletter Template, Newsletter Queue and Newsletter Subscribers etc. So, no need to worry about any extensions or plugin do it in style using Magento built-in functions in style. 3. Social: Today an average person spend about 2-4 hours in entire day in FB. And believe it or not FB is getting bigger day by day from its genuine purpose of creation. Simply people doing business and marketing using FB pages or groups options. As it is simple on FB to reach billions of people with simple click and backlink them to your website. So, simply connect your stores to Social media using the built-in option from Magento and win the race. 4. SEO & Search: If I ask a question, What is bigger than Google? Interestingly it will leave people wordless. So, making your store ready for search engine ready is vital to covert in to sales. Either your store is none more than a piece of Junk in internet. Because no one will ever find your store ever. So for doing this we need to put great contents depending on people search, synonyms of search. So that people can find us. And options like Site Map is about to inform Google that I exist in the world of internet. 5. User Content: Manage your reviews under this section. 6. Marketing Automation: Finally Automation Studio and Exclusion Rules are two powerful tools to automate your store and customize your marketing plans. For the sake of readability, we divide the article into several parts. Here read about content tab. Thanks!!! Enjoy using Magento !! !